We are in the home stretch on our way to the 10th Anniversary Disneyland Half Marathon Weekend!!! EEK!!! We are ALL super excited to be running again this year. 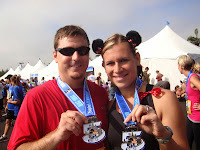 My first DL Half was during the 5th anniversary, and I have a feeling I will see many more anniversaries of this race! It's been our annual tradition since. So, to get you ready with all you need to know...here we GO! The expo is open Thursday (10-8), Friday (12-8), & Saturday (9-4). Remember, you have to actually go to the expo to pick up your own bib, using your photo ID and waiver. Unfortunately, you can no longer pick up a bib for a friend or family member. Yes, it's inconvenient, but I'm seeing this more and more at large races across the country. If you forget your waiver, no worries--they will have printers available at the expo. Another fun part of the expo is the speaker series, though a schedule hasn't been released yet. I'm hoping for a good schedule for Friday, since we don't have park tickets that day. Of course, the MOST fun part of the expo is shopping! 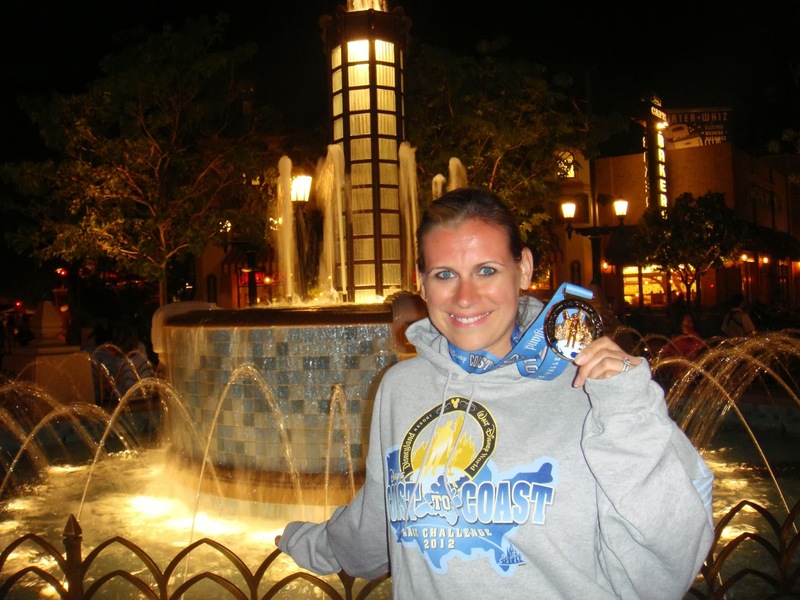 runDisney has great merchandise, but don't overlook some of the other vendors. I love finding new favorite running items at the expo, and often there are some great sales! Remember too, if you are unsure of what corral you are in prior to arriving, your corral information for each race will be listed on your bib. 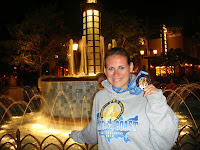 On Thursday night, some lucky runners will be attending the 10th Anniversary Party (my mom is one of them...jealous!). 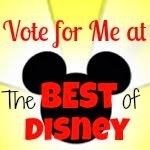 They will be treated to special characters, parade viewing, and of course, shorter lines for some great rides. I would imagine this event to be similar to the annual passholder event we attended back in April. It was a blast, and well worth the extra caffeine to stay up until midnight! 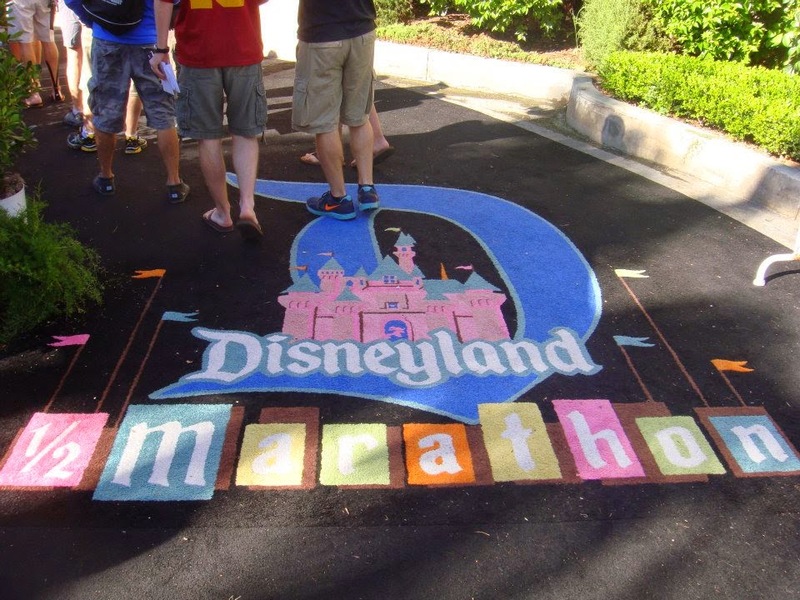 Early Friday morning, runners will be taking off for 3.1 miles of magic through the Disneyland parks. I love these shorter races at Disneyland especially because of how much time you get in the parks. Be sure to get there early enough to use the bathroom and get into your corrals. You definitely won't need to line up quite as early as you do for the half, but leave yourself time. 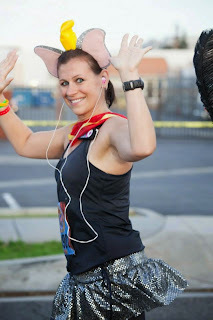 I also love to get up early if I'm not running to cheer on the runners--there are always super cute kids running and awesome costumes for this race! Saturday morning, our family will be heading out to take on the Disneyland 10k. I love this race! So much park time! It starts promptly at 5:30 am, so I'd suggest being down in the staging area no later than 5 so you can get into your corrals without having to rush. Also, if you are worried about being swept, get to your corral early and make your way to the front. Sweeping starts after the last person has crossed the start line, so any extra minutes will be worth it. While we aren't going this year, we have attended the Pasta Party in the past, and it was SUPER fun! If you're going, you are going to want to get there early so you can not only eat, but also take pictures with characters! When we went, all of the characters were dressed in their sports clothes. We got great pictures. It is a buffet, so come hungry, but be forewarned: When we went, I ate so much (way too much) and it really effected me during the half the next day. Remember the #1 rule of racing: don't do anything different on race day (or the night before). Be careful about what you eat, but of course, ENJOY! It's the main event! Prep for an early morning--we usually leave our hotel around 4 (though we'll be at the Disneyland Hotel this year, so we get to sleep in a bit). Aim to arrive around 4:30, especially if you plan to check a bag and/or have a nervous (or pregnant) bladder and will need to use the bathroom...multiple times. Yes, I have a ritual. You will notice many more runners for this event than in the previous two races. The corrals get packed, so get there early if you want to move up to the front. I'll also go on my rant here: Go to your assigned corral or move back. You can't move up. Don't try it, and don't get mad at the volunteers who are enforcing this rule! I always see runners get rude with the volunteers--it's not necessary and it makes us look bad as a group. LOVE the coast to coast! Once the fireworks go off, your in for a few miles in the parks, then you're out on the streets of Anaheim. Be careful! There are a few areas with train tracks, poorly paved roads, and of course that slim path right before you hit Anaheim Stadium. Be aware of your surroundings and please don't run more than 2 abreast, especially in tight spaces. The weather is looking a little warm, so also be sure to hydrate early and hydrate often. Don't be ashamed to slow down in the heat too! When you hit the finish line, it's time to celebrate. If you are a Dumbo runner, don't forget to grab that medal, and of course, get that Coast to Coast too! Celebrate, take pictures, and relish in this HUGE accomplishment. I'm getting butterflies in my stomach just thinking about the fun ahead of us this weekend! PLEASE...if you see us in the parks, come say hi! We've got AWESOME costumes planned for the races, so hopefully we'll stand out. It's time to get packing. We'll see ya real soon!! !